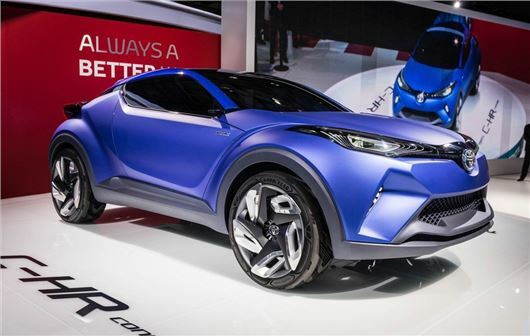 Toyota has premiered a new crossover concept at the 2014 Paris Motor Show. Called C-HR, the bold-looking model is a potential rival to cars like the Renault Captur and Nissan Juke. The C-HR has a coupe-like body on high-riding suspension. There's a low, sloping roofline and a sharp roof spoiler while slim, angular headlights. It also has bold rear lights featuring wave graphics. Though ostensibly a concept, test ‘mules’ with Toyota Urban Cruiser bodywork have been spotted testing in cold weather around Innsbruck, Austria. These used a similar layout to the Lexus RX, with an electric motor at the rear and a petrol engine at the front, giving four-wheel drive. The C-HR will likely go into production as a successor to the discontinued and unpopular Urban Cruiser, competing against the Nissan Juke and the new Honda HR-V. It is unclear when the H-CR concept will go into production but don’t expect to see Toyota’s small crossover until late 2015 - and expect toned-down styling.